On the 24th at 10am, the president of BaekSeok University held a freshman entrance ceremony in Baekseok Hall together with new students, parent teachers, professors, and university staff. 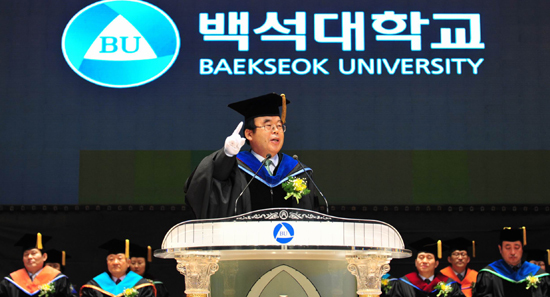 During the entrance ceremony, Baekseok University has a total of 3100 students for year 2014. There’s 220 freshmen majoring in Christian Studies, 270 in Language and Literature, 360 in Social Welfare, 190 in Law & Public Administration, 330 in Mass Communication, 240 in Tourism, 210 in Education, 300 in Information & Communication, 283 in Health Science, 265 in Design & Image, 220 in Fine Arts, 160 in Sports Science, and 52 undecided students. What caught the attention of many is, among the freshmen who attended the ceremony, 2NE1’s Gong Minzy (20 years old) is entering the college too. In 2009, when she started her activities as a singer, she had to halt her studies but was able to obtain her GED just recently. After much thoughts whether to enter a Christian university, in 2014, she enrolled in one as a freshman. Baekseok University is a private Christian institute of higher education located in the city of Cheonan, 90km south of Seoul. Although it wasn’t announced what Minzy will be majoring in, to give you an idea, you can take a look at the various majors that the school offers on their school website here. Examples of the academic divisions in the school include Music, Language & Literature as well as Christian Studies. 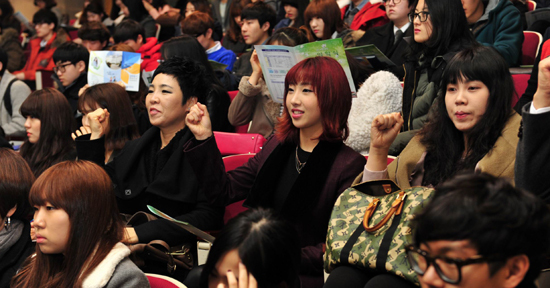 Pingback: Minzy enrolls into Baekseok University & attends the Freshman Entrance Ceremony | Ayo-Minzy!